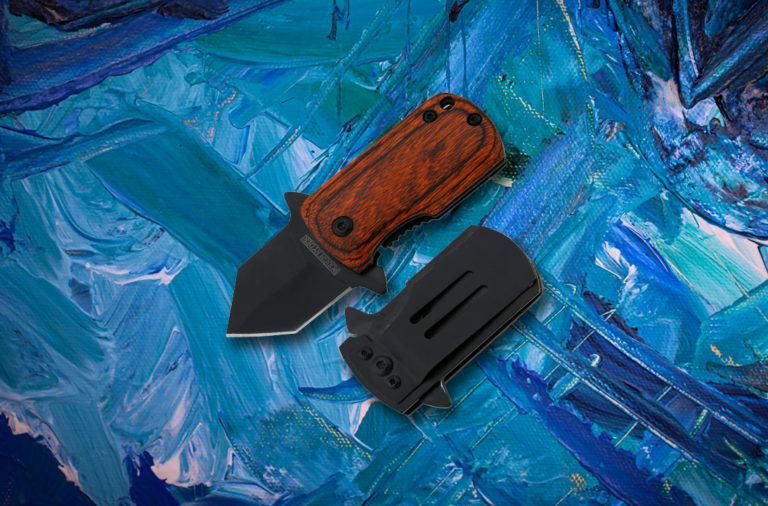 Case makes some of the most beautiful knife displays on the market. But like most things, quality comes at a price. 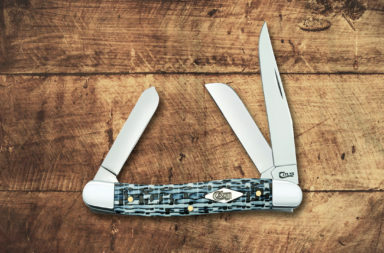 The Case Classics Trapper Set and The Bradford Cutlery Trapper are an exception to that rule. These small and beautiful Case displays are two of the most affordable on the market. 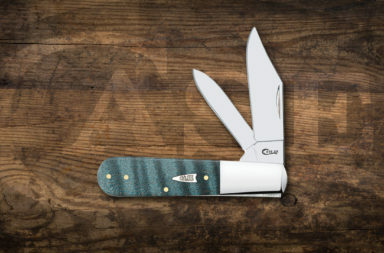 If you want to take your Case collection to the next level without breaking the bank, check out the Case Classics Trapper Set and Bradford Cutlery Trapper. The Case Classics Trapper Set is composed of three pieces; a knife, a collector’s shield, and decorative case. 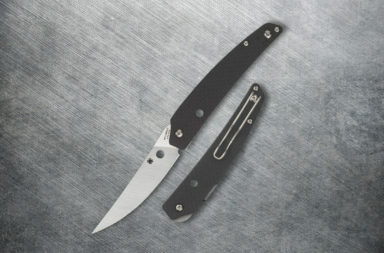 The knife is a beautiful example of a Case trapper. 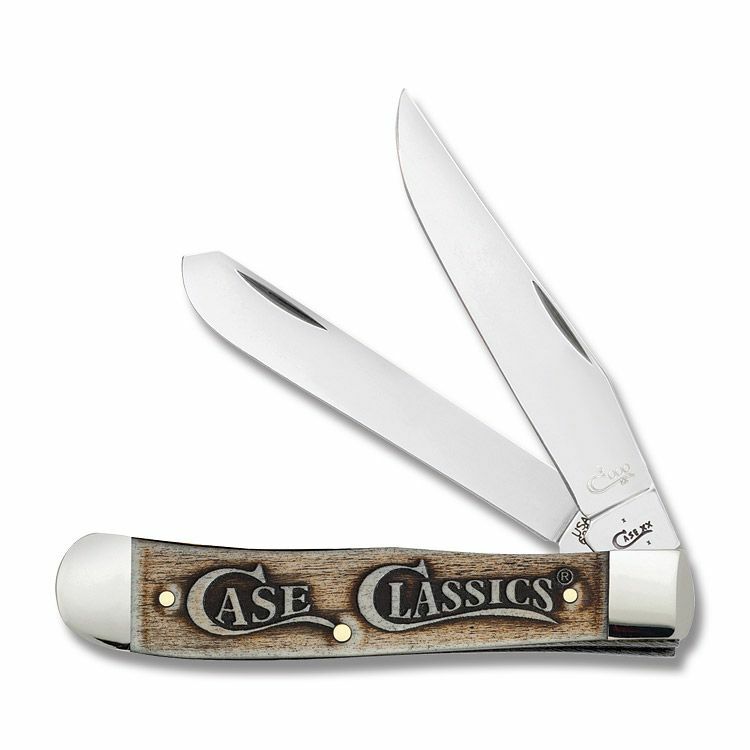 It features unique handles with the words “Case Classics” burned into the smooth bone. This set also comes with a collector’s shield that signifies this set as a genuine Case collectible. These two are inside a decorative display case. It has an attractive leather exterior and a luxurious interior. 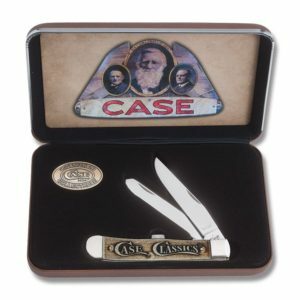 Inside the lid is a print of a classic case painting depicting W.R. Case and sons. 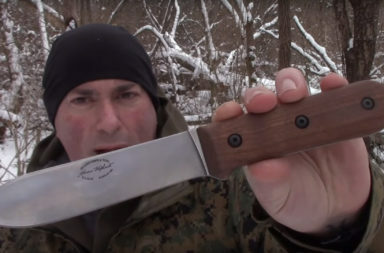 The Trapper is a wonderful example of a Case collectors knife. 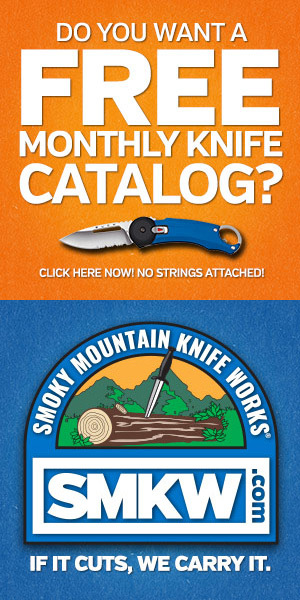 Its Tru-Sharp blades and nickel silver bolsters are polished to a mirror finish. 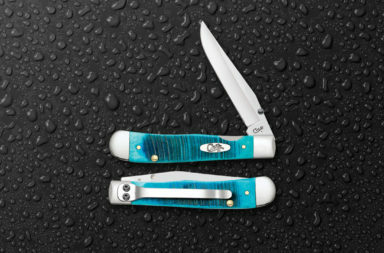 The handles are made from texture-rich smooth bone. The bone has the words “Case Classics” burned into them. 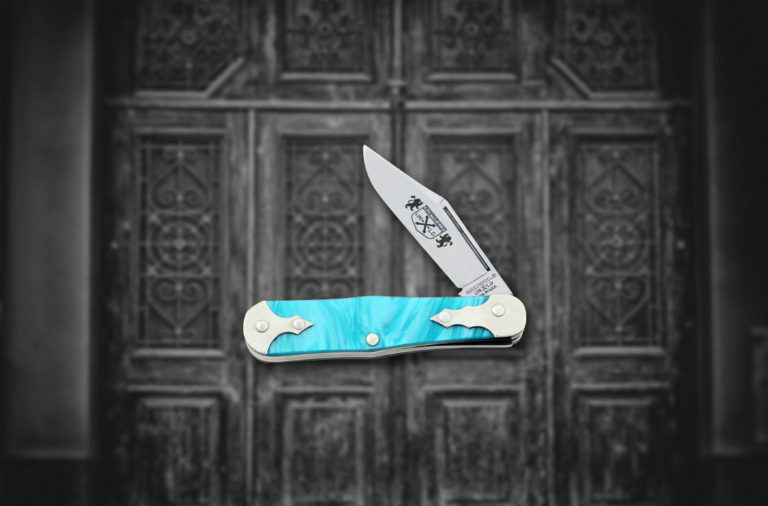 It’s a trapper that really stands out from others in a Case collection and the collectors shield and decorative case just add to the value. The Bradford Cutlery Trapper is another affordable Case display. This display features a beautiful trapper and wooden display case. 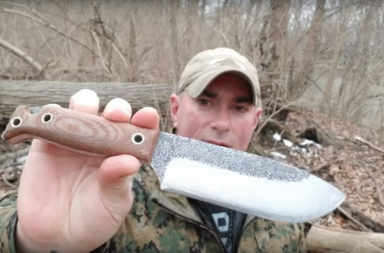 The amber washed handles are what make this knife special. They feature the words “Bradford Cutlery” burned into them. 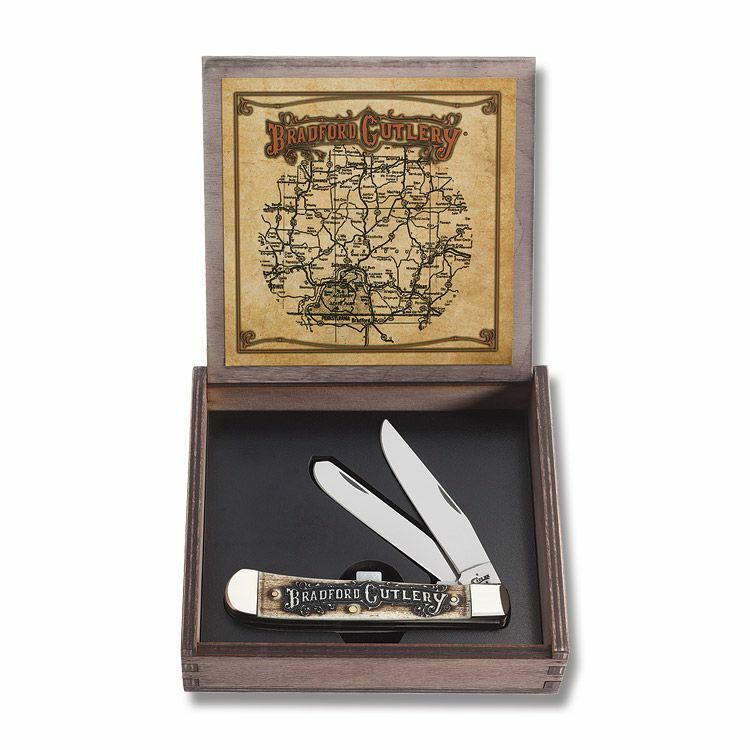 The trapper comes in a wooden box with “Bradford Cutlery” etched into the lid. On the inside there is a print of a vintage map that depicts Bradford, PA. 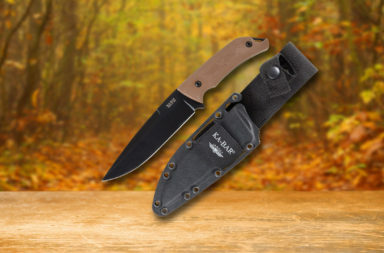 The Bradford Cutlery Trapper features Tru-Sharp stainless steel blades. Both the blades and the nickel silver bolsters are polished to a mirror finish. 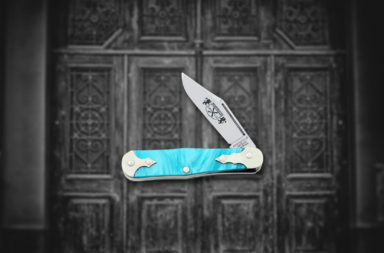 The handles feature rich natural colors and a “Bradford Cutlery” embellishment. 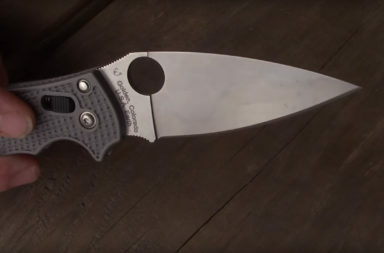 These features make this knife standout from other Case knives off their assembly line. 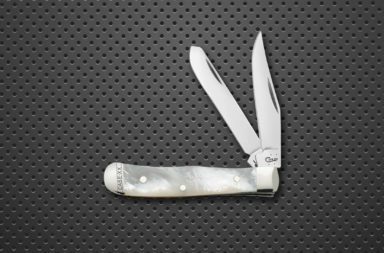 For the money, the Bradford Cutlery Trapper makes for one attractive collectors piece. Nickel silver pins, liners and bolsters. The Case Classics Trapper Set and The Bradford Cutlery Trapper are a great way to take your Case collection to the next level. 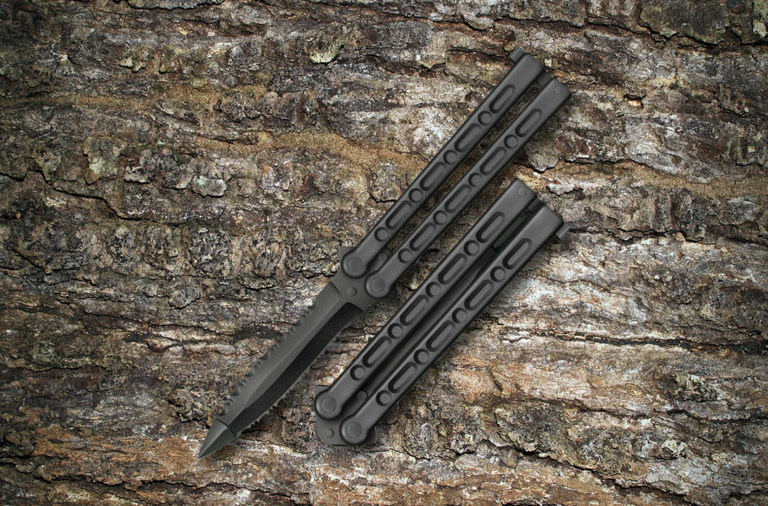 These two display knives are some of the most affordable displays in the Case lineup. 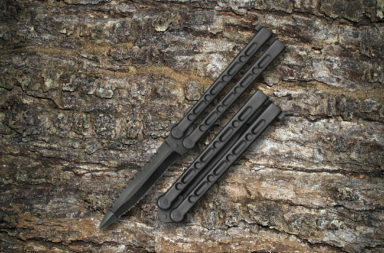 You can find these knives by clicking the links in the article or by clicking the button below.